When selecting a garage door for your Canadian home, you normally have to take into account the function and style of the door. With commercial garage doors for your Canadian business, selecting the right garage doors requires evaluating more than just function and style. Most Canadian homeowners open and close their garage doors two for times a day. This equates to between 730 to 1460 times per year. This does not even come close to the number of times commercial garage doors are used daily or yearly. There is much activity at Canadian businesses every day and that could mean opening and closing the doors 10 to 30 or more times each day, which is 3,650 to 10,950 each year! How will the door be opened and closed? You could opt for a manually operated door, but this can get tedious for you and your employees. Plus all that opening and closing by hand could potentially cause injuries to back, shoulders, or arms. If you opt for an automatic door, make sure the opener you select is rated for the door’s weight and is durable enough to be used frequently every day. What features do you want? Some doors include windows for easy viewing while others do not. Some garage doors can be made entirely of “glass” panels too. You will typically find these at auto dealers. In addition, you have to take into account the harsh Canadian winters and whether you desire insulation. Insulated doors will help block out the cold and keep work areas warmer in between open and closing the doors. What type of security does the door provide? Security is just as much a concern with homeowners as it is with business owners. You want to make sure the door has the right security features to prevent unwanted access to your business and inventories. You may also want to have a pin pads installed that require employees to enter an access code to open and close the door from the outside. How will the door open? 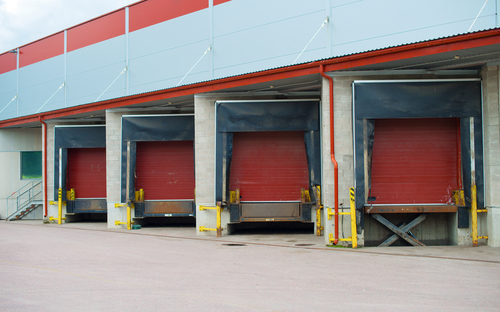 With commercial garage doors, you can have them open on a track, similar to residential doors where they curve horizontally above a work area. Another option, which many businesses use are vertically opening doors. In this type of setup, the door moves upward on the door tracks and does not enter any other work spaces. We hope these tips help you when selecting new commercial garage doors. For further assistance in selecting or questions about commercial garage doors, please feel free to contact Richards-Wilcox Doors at +1 (800) 667-1572 today!